Plantar Fasciitis is the most common condition of heel pain. This condition occurs when the long fibrous plantar fascia ligament along the bottom of the foot develops tears in the tissue resulting in pain and inflammation. The pain of plantar fasciitis is usually located close to where the fascia attaches to the calcaneous, also known as the heel bone. The condition is often misspelled as: plantar fascitis, plantar fasciatis, planters fasciitis, plantar faciatis, and plantar faciaitis. 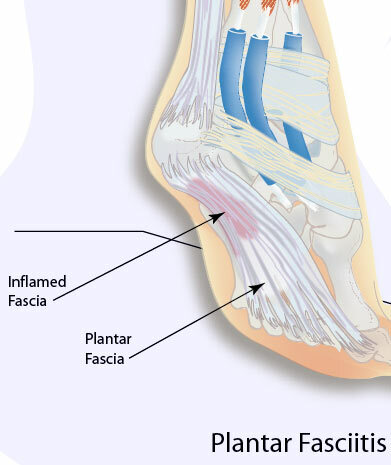 Plantar fasciitis causes the inflammation of the plantar fascia ligament which runs along the bottom of the foot. The plantar fascia ligament is made of fibrous bands of tissue and runs between the heel bone and your toes and stretches with every step. Inflammation develops when tears occur in the tissue. The most common complaint from plantar fasciitis is a burning, stabbing, or aching pain in the heel of the foot. Most sufferers will be able to feel it in the morning because the fascia ligament tightens up during the night while we sleep, causing pain to diminish. However, when we climb out of bed and place pressure on the ligament, it becomes taut and pain is particularly acute. Pain usually decreases as the tissue warms up, but may easily return again after long periods of standing or weight bearing, physical activity, or after getting up after long periods of lethargy or sitting down. In most cases, plantar fasciitis does not require surgery or invasive procedures to stop pain and reverse damage. Conservative treatments are usually all that is required. However, every person's body responds to plantar fasciitis treatment differently and recovery times may vary.